Surfers dedicate their lives to hunting down the biggest waves. They risk serious injury and death to challenge their skills and prove their worth. These surfers become legends due to their bravery, persistency and skills. Wiping out comes with the territory of big wave surfing. They are nervous, but surfers release their fears and focus on their breathing while waiting patiently for the perfect wave to rise. Surfing originated in Hawaii and has been adapted by the entire world. However, big wave surfing is a completely different ballgame. Big wave surfers either paddle in or get towed by jet skis into waves. They hold on tightly to the umbilical rope, as the builds, they release their hold and the jet-ski disappears, leaving the surfer alone in the oceans deadly waves. Big wave surfing is deadly and surfers undergo intense training before risking their lives. In some cases, a wipeout can push surfers down 20 to 50 feet below the surface, and the risk of being held down by consecutive waves is terrifying. Not only do they have to hold their breath, but they have to remain calm in order to figure out which way is up. And don’t forget about the dangerous ocean creatures, namely sharks. “In 2010, Grant and Didier Parker went out to the break to catch the coral-killing starfish, but instead netted a 1.29-ton tiger shark” (GrindTV). Therefore, among the other dangers, sharks could be a surfer’s worst nightmare. 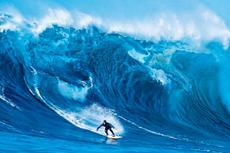 Big wave surfing offers the ride of a lifetime and an intense adrenaline rush. A successful surf offers an outstanding feeling of accomplishment. Respect the courage and fearlessness of big wave surfers and appreciate their passion.